"Every time we try to talk, we end up havin' a punch-up." The Leather Boys are Reggie (Colin Campbell), a young working-class husband in 1960s' Britain, and Pete (Dudley Scott), his motorcycling buddy and best friend. But the story begins with Reggie and Dot (Rita Tushingham), a young couple who marry fresh out of the upper grades and honeymoon at a holiday camp. Neither is ready for the responsibility of marriage, and Dot's outgoing personality soon clashes with Reg's introverted nature. Dot insists on frequent trips to the hair salon and new clothes, while Reg resents the sudden demands on his time and resources. The couple are soon fighting at the drop of a hat, and Reg moves out to stay with his ailing grandmother (Gladys Henson). He introduces Pete as a potential roomer and man about the house, and Reg and Pete end up sharing a room (and a bed) for a while. When Reg and Dot begin to think about reconciliation, Pete does his best to sabotage the couple's efforts, and Reg begins to suspect Pete's feelings for him may extend beyond brotherly love. Young director Sidney J. Furie directed this youth-oriented drama as a follow-up to The Young Ones, adapted by Gillian Freeman from a novel by Elliot George. He creates a convincing sense of working-class British life, setting the action in tiny flats and rowdy cyclist pubs. He also handles the motorcycle racing action nicely, with innovative moving road shots that lend a real sense of speed to these sequences. Furie's widescreen compositions are tidy but naturalistic, and he gives his actors plenty of time and room to work onscreen. Unfortunately, the script and the plotting don't rise to the occasion. Rita Tushingham (A Taste of Honey, Smashing Time) isn't given much to do as the nagging, self-centered Dot, and Colin Campbell doesn't fare much better as Reg, operating at two basic speeds: sensitive contemplation, interspersed with angry bellowing. Dudley Scott acquits himself honorably as Pete, finding ways to communicate his character's internal conflict and sexual orientation within the content limitations imposed on the film, but he's given few opportunities to express himself directly and often seems merely dazed. 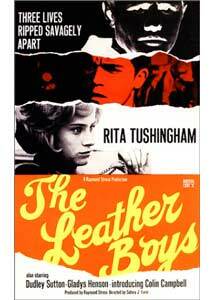 The Leather Boys isn't really "bad" in the conventional sense of the word. But the drama that might have been is forced into melodramatic constraints that ultimately limit its impact. There's plenty of shouting and carrying on, but precious little emotional impact, and the film's most daring ideas are shrouded and finally buried in layers of nervous obfuscation. Made ten years later, this might have been a very different and much better movie�as it is, it feels like youth-market exploitation gussied up to look like a mature drama, and ultimately fails on both counts. Image Transfer Review: Kino on Video presents The Leather Boys in its original 2.35:1 widescreen theatrical aspect ratio. That's about all that can be said for the nonanamorphic transfer, recycled from a dated analog laserdisc master in interlaced, 30-frames-per-second format. The film's finely textured black & white photography suffers badly in the process, with red/blue false-color aliasing producing rainbows and shimmering throughout the film. Pausing the DVD reveals analog color artifacts in nearly every frame, and while some are less noticeable when the film is running at speed, others are extremely visible and very distracting. The source print is in decent shape, though the film exhibits a few image defects that appear to have originated in-camera (a running scratch in one scene, a "hair in the gate" in another). But the nonanamorphic image exhibits muddy textures, edge enhancement, and stairstepping on thin diagonal lines, and the presentation is extremely disappointing by current DVD standards. Audio Transfer Review: The Leather Boys is presented with its original monaural soundtrack, rendered in Dolby Digital 2.0 format for ProLogic-decoding to the center speaker. The analog audio track suffers from the limitations of British recording technology of the time�dialogue is almost always recorded "live" on the set with significant noise and echo, frequency and dynamic range are very limited, and the track contains a few crackles and pops, along with a degree of hiss. The DVD transfer is adequate given the source, but the soundtrack is in need of some cleanup. Extras Review: Kino on Video presents The Leather Boys with nicely-designed full-motion menus, 12 chapter stops, and a few marketing-related extras. The Theatrical Trailer is presented in 2.35:1 nonanamorphic letterboxed format, running about 2 minutes and 45 seconds. The trailer consists of dramatic clips from the film, accompanied by a hyperbolic exploitation-oriented voice-over that (unintentionally?) describes Pete as "a gay, good-time bachelor." A set of Pressbook Excerpts presents material from the original publicity presskit, rendered as pages of on-screen text along with a Photo Gallery of 17 black & white promotional stills. The press releases are designed for local promotion, with space for the name of the theatre where the film would be playing and canned interviews with Rita Tushingham, Colin Campbell, Dudley Scott, Gladys Henson, and Sidney J. Furie. An interesting relic from the film's marketing, though none of the brief articles provide much insight into the movie or its production. The Leather Boys is an interesting if somewhat tentative look at youthful working-class relationships in Britain in the early 1960s. Unfortunately, Kino's DVD features an awful transfer that makes the disc hard to recommend.